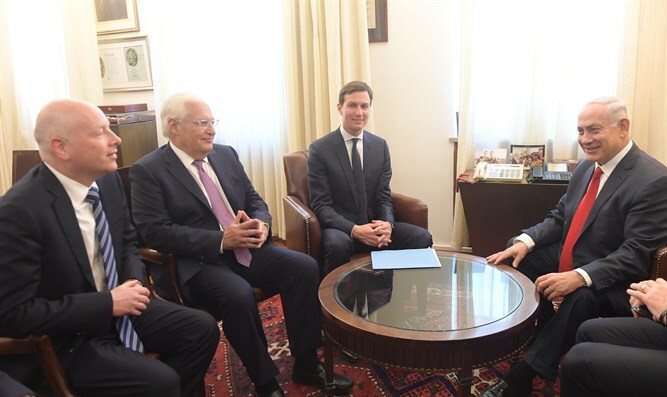 Jared Kushner, Jason Greenblatt and Ambassador David Friedman blast Hamas, urge it to "free" the people of Gaza. Jared Kushner, senior adviser to U.S. President Donald Trump, Jason Greenblatt, the special U.S. representative for international negotiations, and U.S ambassador to Israel David Friedman on Thursday said Hamas is prolonging the suffering of the residents of Gaza. In an op-ed they wrote for The Washington Post, the three urged Hamas to accept Israel’s existence and added that the terrorist group is fighting a war that has long been lost. “At the end of a productive six-day trip to the region recently, one reality was painfully clear: The nightmare of Hamas’s leadership is continuing and needlessly prolonging the suffering of the Palestinian people in Gaza,” they wrote. “International donors are conflicted: Should they try to help the people directly, at the certain risk of enriching terrorists, or withhold funding to Hamas and watch the people it is supposed to govern suffer? In the past, investments in badly needed infrastructure have been diverted for weapons and other malign uses, and even the projects that are built are often destroyed as a consequence of Hamas’s aggression,” noted Kushner, Greenblatt and Friedman. “Until governance changes or Hamas recognizes the state of Israel, abides by previous diplomatic agreements and renounces violence, there is no good option,” they stressed. “Seventy years after the founding of Israel, it would be wise for Hamas to acknowledge that the existence of Israel is a permanent reality. Almost all in the Middle East have come to accept this fact, and many even embrace it. At the expense of the Palestinian people, Hamas is fighting a morally bankrupt, decades-old war that has long been lost,” the three continued. “For far too long, Gaza has lurched from crisis to crisis, sustained by emergency appeals and one-time caravans of aid, without dealing with the root cause: Hamas leadership is holding the Palestinians of Gaza captive. This problem must be recognized and resolved or we will witness yet another disastrous cycle,” they concluded. Greenblatt has continuously criticized Hamas, which has ruled Gaza with an iron fist since 2007, for diverting funds it receives to terrorism against Israel instead of using it to improve the lives of Gazans. “In the meantime, the people of Gaza have little electricity, high unemployment, and continue to suffer. Hamas continues to divert desperately needed money and resources from the Palestinians of Gaza,” he continued. “These actions only lead to the disastrous escalation of violence and more people left suffering under failed governance. Hamas is hurting everyone!” he concluded. On Sunday, a day after Gaza terrorist groups fired more than 200 rockets at southern Israel, Greenblatt also ripped Hamas and urged the group to “try peace” instead of firing rockets and inciting weekly riots along the border.